The name says it all. Peachland, British Columbia is nestled among orchards on the shores of Okanagan Lake, in the BC Okanagan Valley. The surrounding land has grown fruit trees for a century, and is now a quaint and popular lakeside community. In the summer, swimming, boating, paddle boarding and fishing are popular on Okanagan Lake. The main street of Peachland – or the Peachland Promenade – runs along the lake, and provides access to 11 kilometers of waterfront, including the Peachland Farmers and Crafters Market. Sometimes the best vacations involve nothing more than lazing on the beach, or sitting back enjoying a coffee or a delicious meal at one of the many beachside cafes, pubs and restaurant to take in the amazing lake views. Across the lake from Peachland is Rattlesnake Island, home of the legendary Lake Okanagan Sea Monster, the Ogopogo. Hardy Falls Park, near antlers Beach Park, offers a lovely reprise from soaring temperatures in the summer. A short, easy walking trail leads to a small waterfall at the end of a canyon, traversing several footbridges along the way. Bring a picnic and dip your feet in cool waters. Admire the wildflowers in the spring. More rugged hiking and spectacular vistas can be found along the trails of Pin Cushion Mountain and the Trepanier Bench Trails. For a unique experience gather at dusk at the Peachland Historic Schoolhouse to view almost 2000 bats, one of the largest bat colonies in British Columbia. Experience the small town culture at the Annual Peachland Community Fall Fair held every September for over 100 years. 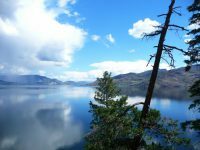 Chose a wonderful Peachland Bed and Breakfast for your stay in the area and get even more insider knowledge of what to see and do while exploring the Peachland area. Peachland’s only Lake Okanagan waterfront haven. 3 luxury suites with TV, A/C, fpl., robes, private baths & private patios with sweeping views. 400′ of lakefront with dock, swimming raft, canoes & kayaks for your use. Okanagan Oasis B&B, an adult oriented mini-resort, is not your typical B&B! Featured amenities such as a heated outdoor salt water pool, hot tub, fire pit, pond & waterfall, lovely gardens and a fabulous Okanagan lake view from all rooms. Our B&B is truly a place to relax and unwind.